Often the first opportunity to really look at options, aptitudes, likes, and dislikes with regards to employment, takes place within the Island’s school system. 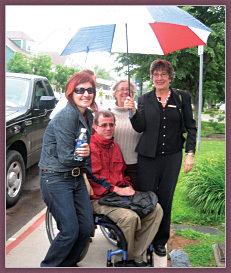 In the 2007 - 2008 school year there were 83 students with mobility impairment in the provincial school system. The PEI Department of Education and Early Childhood Development makes a commitment to an inclusive model of education for all students. The Department ensures that strategies are in place for students with physical and mobility impairment to attend classes and extra-curricular activities, wherever possible with their peers, and to safely exit schools in an emergency. The Department also maintains a fund for Assistive Technology (AT) devices in schools. When alternative educational programming and/or accommodations are required for students with a disability - teachers, administrators, Board-based consultants, and parents, together with student individuals, determine an education plan that works. The Community Access Facilitator works with the Province’s four Special Education Consultants, four Speech Language Pathologists, as well as resource teachers, parents, schools, school boards, or community service providers to form a support team to work with each identified student between the ages of 13 and 21 years (grades 8 to 12). Among other tasks, the Community Access Facilitator ensures that practical transition plans are in place to enable students, including those with mobility impairment, to transfer from school to community, to continue to build on their strengths, and ultimately to find meaningful employment. On Prince Edward Island achieving overall accessibility at post secondary educational facilities is an ongoing process. The University of Prince Edward Island is committed to creating an inclusive community for all students, including equal access to University services, programs, and facilities for students with disabilities. UPEI’s Accessibility Services is located in the Webster Centre for Teaching and Learning in the Robertson Library. Students with a disability planning on attending UPEI should set up a meeting with the Accessibility Services Coordinator as early as possible. At Holland College students with mobility-related disabilities or other disabilities and their parents, or mature students with disabilities should contact the coordinator of Student Academic Support, a branch of Student Services. The new campus facility at Holland College has an elevator, ample disability parking, and, while not universally accessible, was designed with accessibility in mind. The new residence has three accessible single units in it. Collège Acadie Î.-P.-É. is the only francophone community college in the province. Post-secondary programs are delivered from Wellington, Charlottetown, and DeBlois and they are equipped with video conferencing systems and computerized data networks to facilitate distance learning. The Academy of Learning has limited accessibility in the Charlottetown and Montague locations but does provide students who have a mobility disability with online training from home (or another location that they may prefer) with 100% access to instructors. They are completely accessible in Summerside. CompuCollege in Charlottetown has a fully accessible campus. If you contact them, they will provide tours of the facility. The Harmony Training Centre in Souris offers general employment skills training, career exploration, upgrading programs, specialized training in a number of areas, and community development and entrepreneurship training in an accessible space. The PEI Department of Social Services and Seniors - Disability Support Program offers supports for job coaching, job mentoring, and disability supports for self employment and entrepreneurship. The Department of Innovation and Advanced Learning offers the opportunity to apprentice. Interested persons enroll in Apprenticeship after they start work in a designated trade. The PEI Council of People with Disabilities promotes self-help for persons with disabilities, creates public awareness of the concerns of persons with disabilities, and encourages a positive image of them. They also provide employment and career services. The transitions programs in Island High Schools and at Holland College and UPEI can also help Islanders with disabilities trying to enter the workforce to make choices and select a program of education that works for them. In terms of financing education, students with a disability usually have additional costs that non-disabled students do not. Some of the significant financial challenges facing students with disabilities may for example arise from leaving the family home, having to acquire paid attendant-care services, finding accessible housing, paying transportation costs, purchasing assistive technologies, and financing various necessary health-related supplies. Students can go to the Government of PEI’s Student Loans office on Fitzroy Street, in Charlottetown, to review programs such as the Canada Study Grant for the Accommodation of Students with Permanent Disabilities or the Canada Access Grant for Students with Permanent Disabilities. There is also information at the Department of Education and Early Childhood Development’s website. The National Educational Association of Disabled Students (NEADS) awards up to four individual Equity Through Education Scholarships per year, each for three years, at a value of $3,000. A careful review of financial aid available through service groups such as Rotary Clubs is advisable. There are also suggested resources at the back of this booklet in the Resource Directory. When Canadians with mobility impairment are given the support they need to have a career, their improved quality of life contributes to a healthy economy and to social diversity. The alternative is very costly. Work often plays a role in defining people’s view of themselves, their sense of self-worth, and their contribution to their community and country. Employment is not only a means to earn a living - through work people make social contacts, and develop friendships. Prince Edward Island needs to do more to implement inclusive employment practices and to find ways to improve the amount and the quality of employment for persons with mobility impairment. For persons with disabilities, equality means that positive steps must be taken to ensure that policies, standards, programs and services, and education are fully accessible and inclusive. The Province has an obligation to improve and eliminate the barriers and conditions that create social and economic hardship and ultimately, poverty. PEI’s Disability Support Program does provide a maximum of $3,000 for employers to modify a place of employment.